Piemonte airports and travel: Turin has an international airport which is served by budget airlines. Milan is a train ride away. Piemonte (also known by its English name, Piedmont) is located in the north-west of Italy, bordering France. Piemonte provided the short-lived Kingdom of Italy with its monarchs, the Savoy family, and the rest of the world with Fiat cars. The regional capital, Turin, was the home of the 2006 Winter Olympics. Much of the region is mountainous, covered in ice and snow, reaching up to the heights of Monte Rosa (4,633m). But the region is one of contrasts - from rich rolling vineyards to the mountain wonderland of the Gran Paradiso National Park. Piemonte wines include Barolo, Barbaresco, Asti Spumante and Vermouth. Among the region's prized products are truffles from the Alba area, cheeses such as Gorgonzola, and a delicious range of biscuits and chocolates. 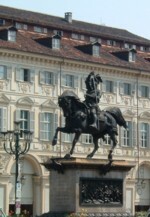 Turin is the capital of Piemonte, and a popular tourist destination, particularly as budget airlines fly there from the UK. Skiing and mountain sports also attract many visitors to the area. Sestriere is among the region's leading skiing resorts. The more peaceful and verdant charms of Lakes Maggiore and Orte are also extremely popular tourist destinations. Those keen to explore less-known corners of the regions will be rewarded with gems like Alba with its many medieval towers, the hillside chapels and imposing religious sanctuary above Biella or the historical, costumed 'Battle of the Oranges' at Ivrea. One of the strangest sights of the region is the Sacra di San Michele, a medieval religious complex piled onto the summit of Monte Pirchiriano, near Turin. Founded in the 10th century, added to over the centuries and restored after an earthquake in 1885, the main church dates back to 12th and 13th centuries. Among the intriguing features are the 'Staircase of the Dead', lined with tombs of monks, and the Portal of the Zodiac, carved c.1120 with Biblical scenes and the signs of the zodiac.